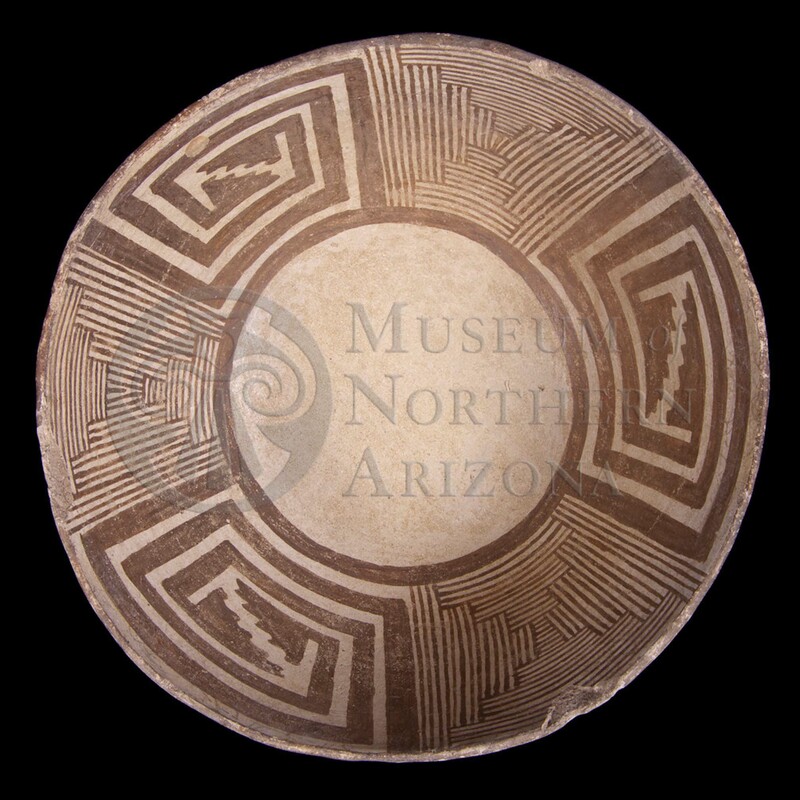 Mimbres Transitional (Style 2) bowl from the Museum of Northern Arizona collections. Click the image to open the Mimbres Style 2 gallery. Mimbres Style 2 pottery is the transitional type between Mimbres Boldface (Style 1) and Mimbres Classic (Style 3). 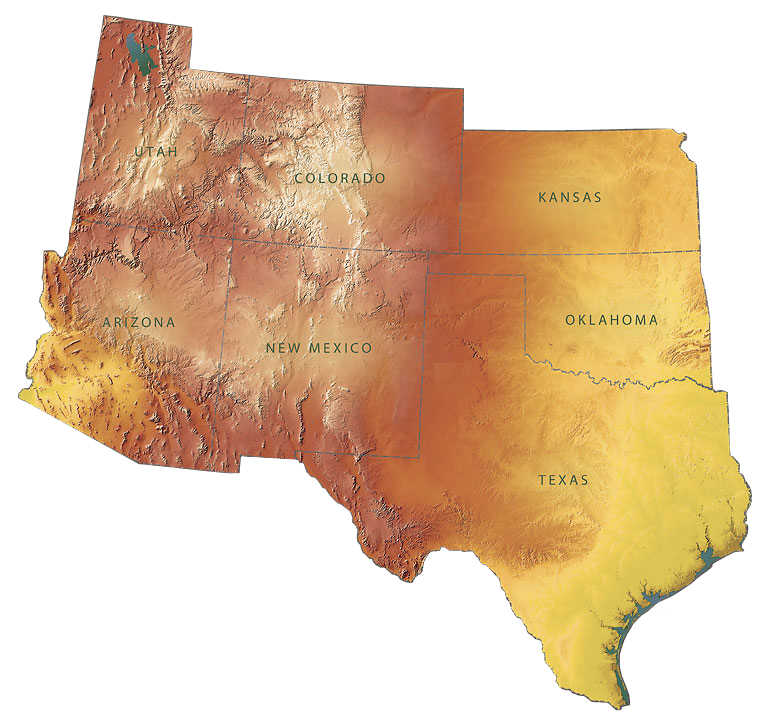 As with the other types, Style 2 pottery is concentrated in southern New Mexico north to the Upper Gila, east to around El Paso, Texas, and south into Chihuahua, Mexico, with vessels occasionally found as far west as west-central Arizona. Temper: Quartz sand or crushed quartz, volcanic rock, or sherds; often fine and rounded. Surface Finish: Bowl exteriors smoothed, unslipped; interiors smoothed, heavily white-slipped (chalky and often irregular), polished, painted. Design: Primarily interiors, occasionally exteriors; design to rim (early) or below, but touching rim band (late); straight line hatchure (early: coarse/wide, late: finer) bordered by bold lines; open, unpainted circle at bottom of bowl; rim band common; layouts quadrant (early) or mirrored; some figurative elements. Comparisons: Cibola Paste/Mimbres Design: whiteware vessels painted with Mimbres designs, generally found in the Reserve area, Arizona and the Upper Gila Valley, New Mexico; typically unslipped. Distinguished from Style 1 by use of straight-line hatchure and/or central open circle and rim bands. Style III is more finely executed, with the design separate from the rim band(s). The slip on Chupadero Black-on-white cannot be scratched with a fingernail. Other Names: Mimbres Boldface, Mangas Black-on-white, Mangus Black-on-white, Transitional, Mimbres Black-on-white, Classic Black-on-white.